Our friends at Dogs Deserve Better, 2003 First Place Winner of the ASPCA/Chase Pet Protector Award, and a voice for chained and penned dogs is holding an online auction full of donated items via Ebay to help raise funds for dogs in need. This is a great time of year to find some great gifts for the upcoming holidays all while helping out our furry little friends! 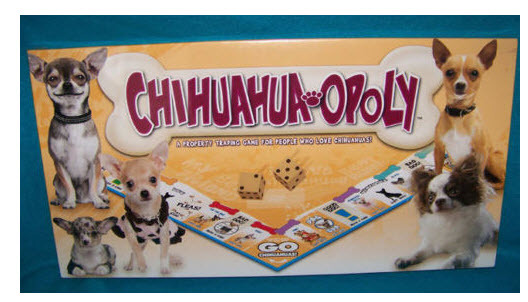 Our favorite find was this Chihuahua-opoly , I have never thought of looking for a Chihuahua board game and thought maybe we could help raise the bidding and help out Dogs Deserve Better, since right now there is only 1 bid for 99cents! This entry was posted in Chihuahua Stuff and tagged Board Game, Chi mom, Chihuahua, Chihuahua Board Game, Chihuahua Games, Chihuahua Gift, Chihuahua Mamas, Chihuahua-opoly, Games, Small Dog. Bookmark the permalink.